The inspiration for this pots de créme actually came from the fondue challenge on Food52. I submitted a savory fondue, but couldn’t stop thinking about what I would make for a sweet one. As someone who typically prefers potato chips over chocolate, I knew it would need a salty element to satisfy my salty-sweet tooth. The following week’s challenge was a pudding recipe and, with the encouragement of a fellow Food52 member, I decided on the combo of chocolate, chile and bacon. I used Dorie Greenspan‘s pots de creme recipe from Baking from My Home to Yours as a jumping off point and made a number of adjustments (dark chocolate instead of bittersweet, less sugar, addition of chile powder and cinnamon). I love the candied bacon from Clinton Street Bakery, but wanted to incorporate some maple flavor so broiled bacon drizzled with maple syrup until crispy. 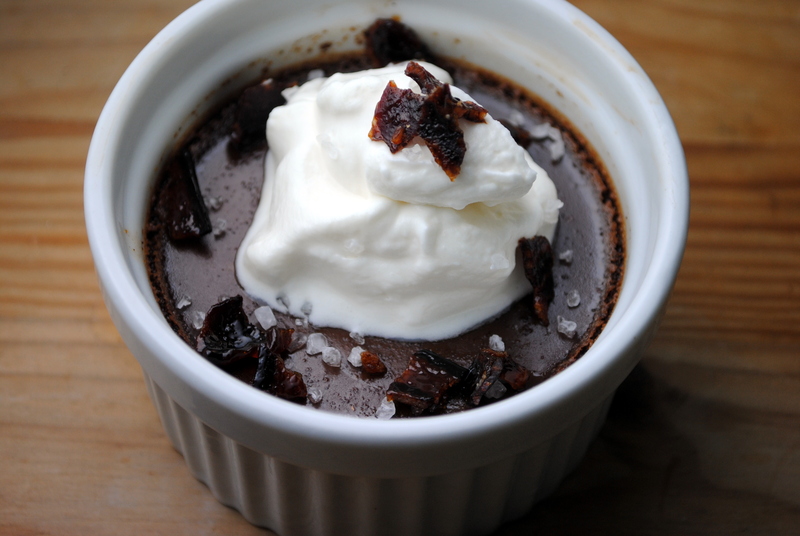 The spiced pots de creme really are very good on their own. Warm in flavor and feeling, they are both decadent and light. Although there is a generous amount of chile powder, they are spiced, not spicy. If you enjoy them straight out of the oven (after allowing them to cool slightly) they have the texture of pudding beneath the skin. Or, if you allow them to cool in the refrigerator for three hours to overnight, they will firm up slightly. Both are excellent. I made my maple whipped cream with just a hint of maple, but you can adjust as you like. My original plan was to include the sea salt, and that is how I enjoyed it last night (you can see the salt crystals in my photo), but I actually think the bacon lends enough saltiness to the dish. I leave it up to you. The maple candied bacon would also be good crumbled on top of salads. Preheat the broiler. 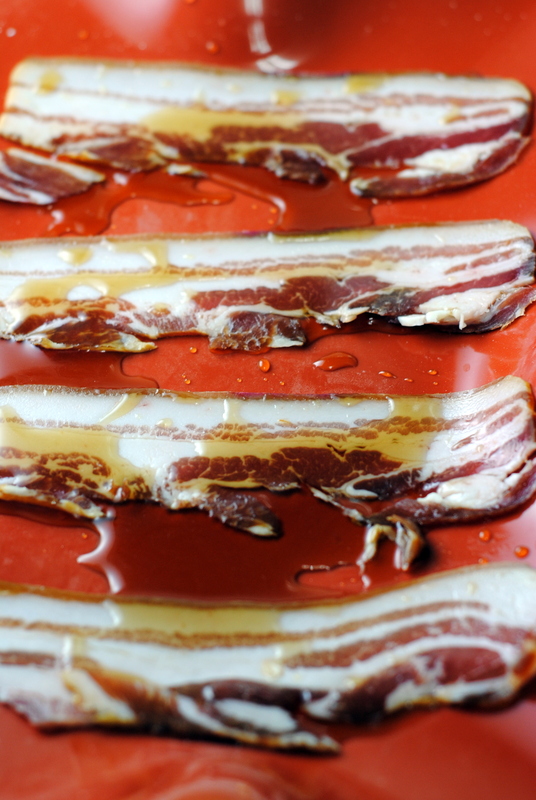 Arrange the bacon on a Silpat-lined baking sheet. Drizzle with the maple syrup. Broil, flipping once, until crispy and browned. Be careful not to burn. Remove from the broiler and allow to cool. Put in a container and refrigerate until ready to use. Put the heavy cream and maple syrup in a bowl. Whisk vigorously until thickened to your liking (my electric whisk made very quick work of this). Preheat the oven to 325F. Put the chocolate in a heatproof bowl. Bring 1/2 cup of the heavy cream just to a boil. 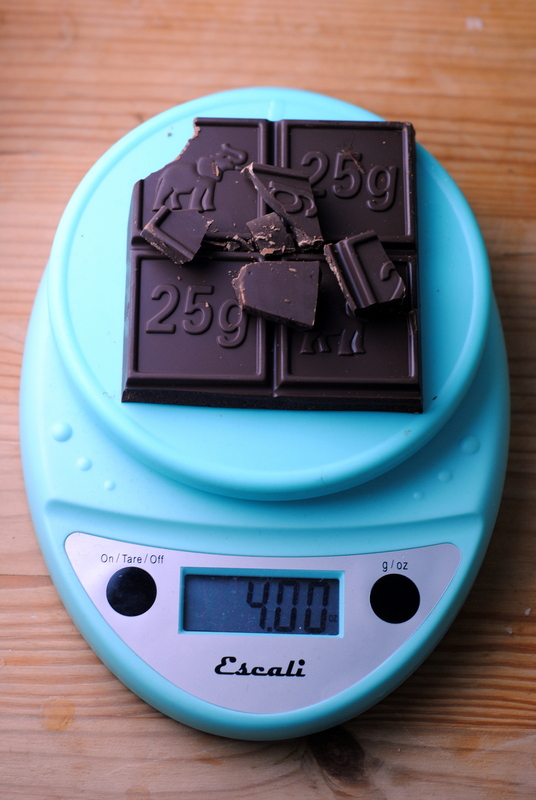 Pour over the chocolate and allow to sit for 1 minute. Gently stir with a rubber spatula until combined and smooth. Set aside. Combine the milk and remaining 1 cup cream in a small pot and bring to a boil. Meanwhile, whisk the eggs, yolks, sugar, and salt until well combined and slightly thickened. 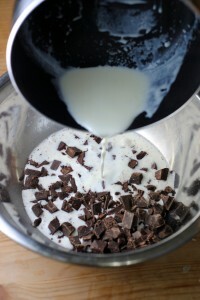 While whisking, drizzle in a small amount of the hot cream mixture to temper the eggs. Slowly pour in the remaining liquid while whisking. 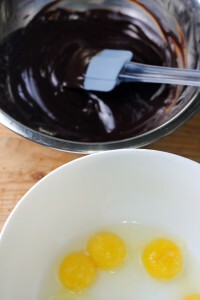 Slowly whisk the egg mixture into the chocolate mixture until fully incorporated. Stir in the chile powder and cinnamon. 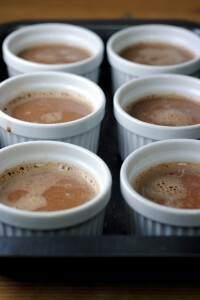 Pour the custard into 6 to 8 ramekins, pots de creme cups, or other small oven-safe vessels. Transfer the ramekins to a roasting or baking pan. Pour in hot water until it comes halfway up the sides of the ramekins. Cover tightly with plastic wrap, poke two holes in opposite corners, and carefully put in the oven. 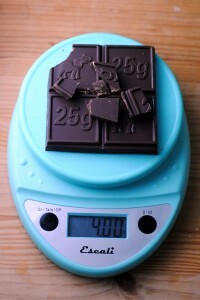 Bake for 30 to 40 minutes, or until the tops are slightly darkened and the pudding jiggles lightly when shaken. Carefully remove the pan from the oven. Allow to cool, still covered in plastic wrap and in the water bath, for at least 10 minutes. Uncover, remove from the pan, and allow to cool to room temperature. Pots de creme can either be served now or refrigerated for later. To serve, spoon a dollop of maple whipped cream in the center of the pots de creme. Sprinkle with crumbled maple candied bacon. Garnish with sea salt, if desired. Bon appetit! What a great dessert! 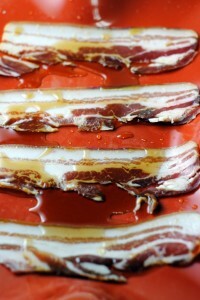 I love every component, from the candies bacon to the maple cream… it all sounds delicious! Mmmm…candied bacon. So wrong and yet so right! These are unreal – I am seriously smitten! Thanks so much for linking them up in the Holiday Recipe Exchange!